Google Analytics is nice enough to show me which posts you guys like the most, and the ones where I compile the top trends for boys and girls are definitely the most popular. 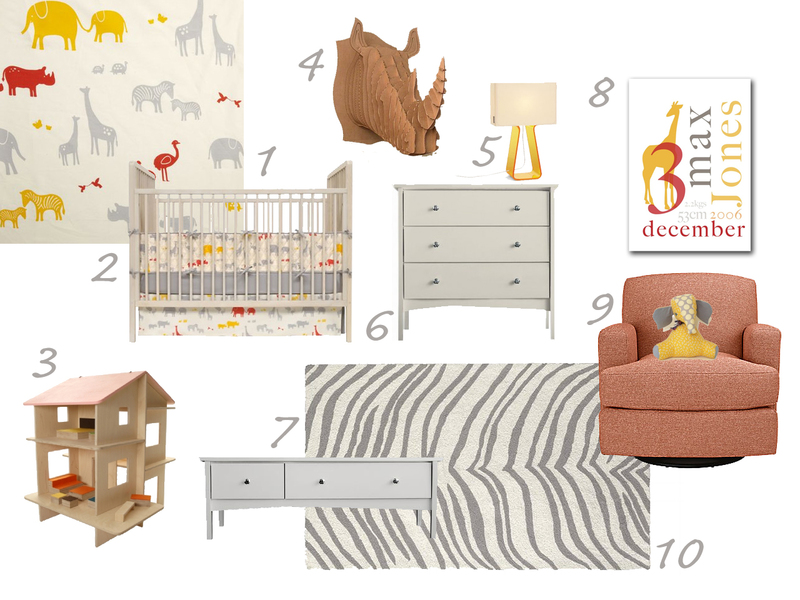 So here are my top picks for 2011 baby boy designs. I am using the word design instead of theme because everyone seems to be getting away from overly-themed rooms and is focusing on a few key elements that tie the room together instead of a nursery-in-a-box kind of look. Update: I have been getting a lot of emails/comments regarding this post and where certain items are from. There are links below each photo that link to the original source, and you may be able to find the name of the item there. Othewise, I am sorry, I did not design the items so I don't really know. Try different combos of google, google images and froogle.com (googles product search site) to see what you can come up with when trying to locate the source. Or, email the actualy designer of the room and see if they can help you. Thanks! Safari - Gone are the days of pastel lions and puffy elephants, the new safari mixes modern elements such as leopard with sleek-shaped jungle animals. Think subtle animal prints such as giraffe, and elephant, zebra and lion silhouettes. I love animal print rugs to tie this look together! B is for Blue and Boy - Blue has been and always will be a popular choice for boys. But blue doesn't have to be boring. Do something creative with the paint treatment, and mix multiple blue patterns for a layered look. Or, shift your blue color towards green for a lovely teal effect. 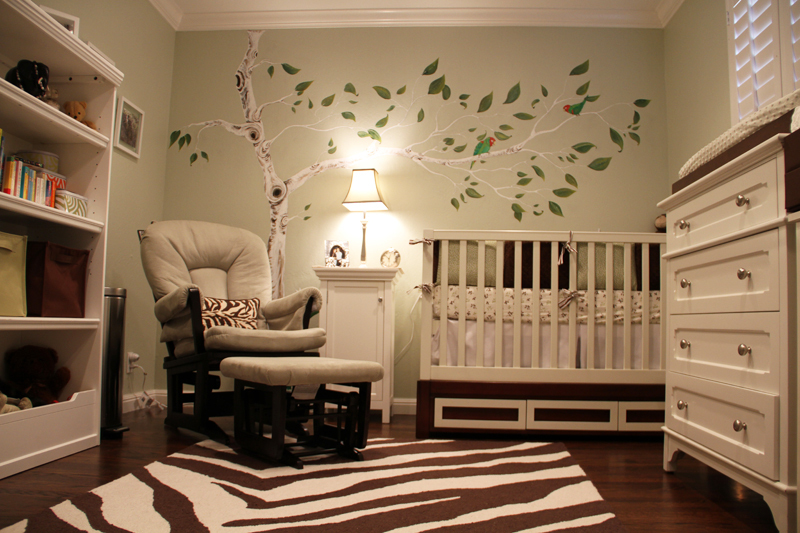 Woodland Chic - Bring natural elements inside with this boy-friendly design. Rustic wood pieces, trees and owls combine manly elements with fun. 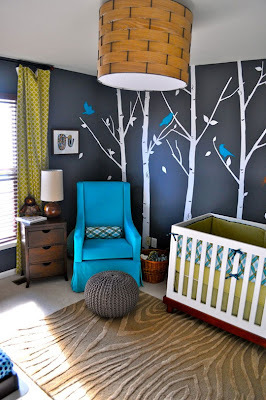 This combo is great if you want to do modern, but also incorporate animals and nature. Nautical - No matter where you live, this theme is always popular. Navy is such a classic choice for baby boys, and just a few nautical accents are needed to achieve this look. This room does it perfectly with the board and batten and the nautical prints. This room combines a ton of nautical elements and is pretty theme-y. I would take just a few of these ideas for inspiration. Stripes - I am still obsessed with stripes. Nothing makes a graphic impact like bold horizontal stripes. You can do one wall, an entire room, or an accent stripe at chair rail or picture height. 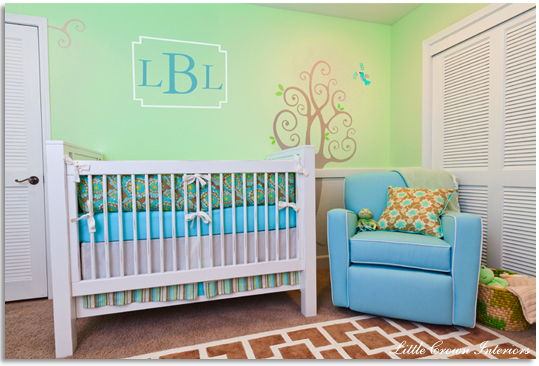 Layer with other graphic fabric accents for the crib bedding to get a textured look. 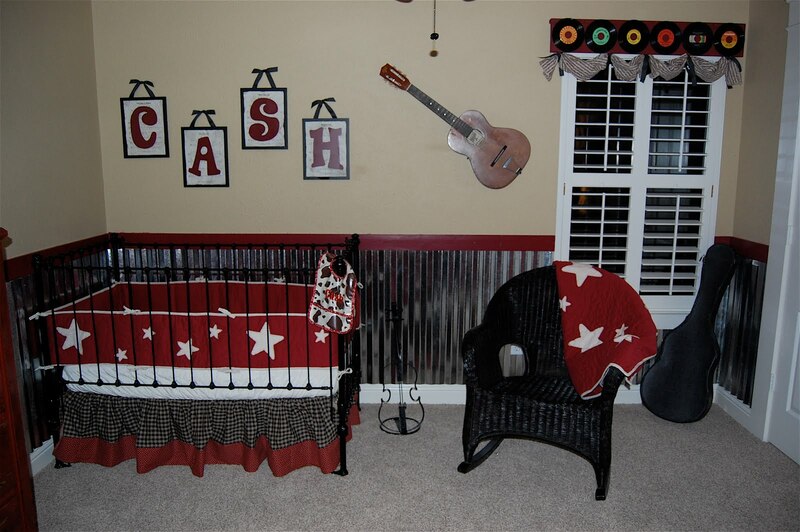 Rockstar - Hipsters are having babies with names like Jax and Cash and they are doing up the nursery right. Black, red and grey are popular colors for this theme. 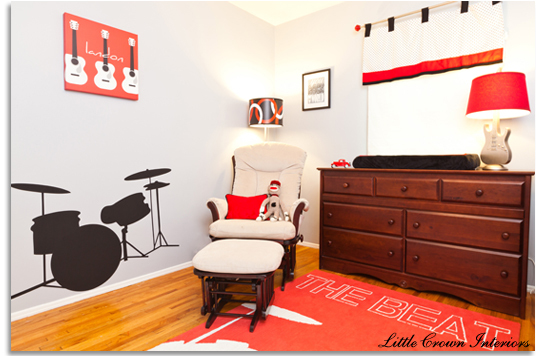 Decorate with vinyl records, guitar silhouettes and bold, graphic patterns. Don't be afraid to mix brown furniture in there, it looks surprisingly good with the black. 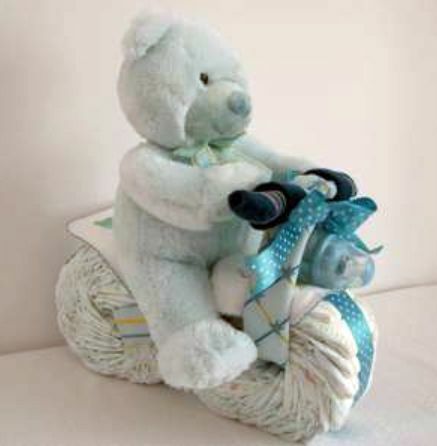 That's it for my 2011 baby boy nursery wrap up - hope that gets you going on your own space! I must say, it was super easy, and did not require rolling and rubberbanding of the individual diapers. Just my kind of DIY project! If you don't have time to make your own diaper cake, I suggest you check out eDiaperCakes.com, a mom-owned business that hand makes adorable diaper cakes in tons of color combinations. Prices range from $50 to a little over $100, and they even offer cakes with a book theme, which I love. Plus, shipping is only $5. And you don't even have to tell anyone you didn't make it yourself! Can you please tell me what is the name/maker of the crib bedding with the animal silhouettes in gray/yellow/red? Thanks much! I would love to know the details of the first picture with the animal print rug. 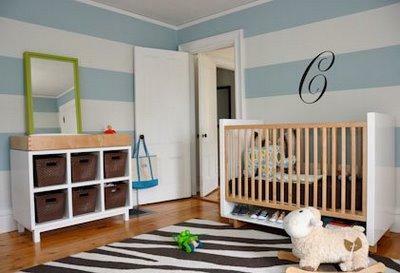 what is the paint color and where is the crib bedding from? I LOVE IT! Similar guitar art is available from Lex Modern, but I am not sure about the personalized version. 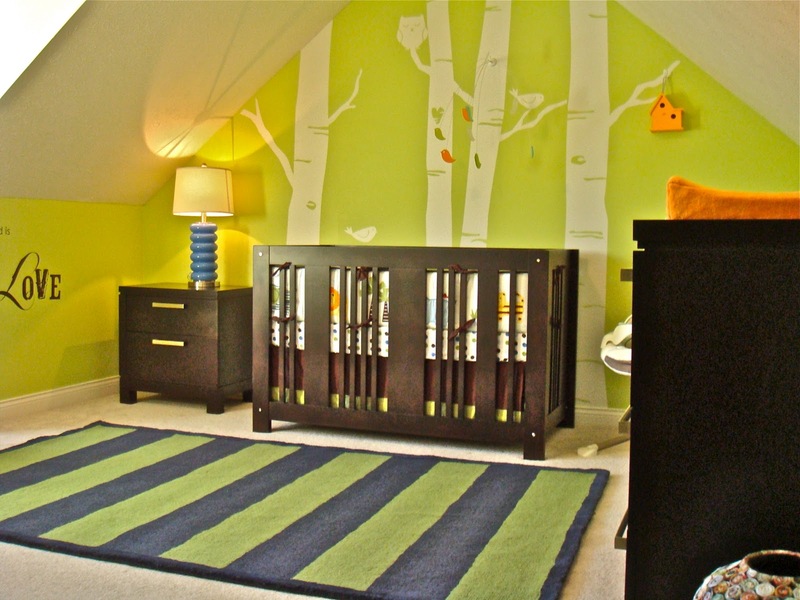 Maybe you can email the designers from Little Crown Interiors and they can help you. Can you tell me where it is from? 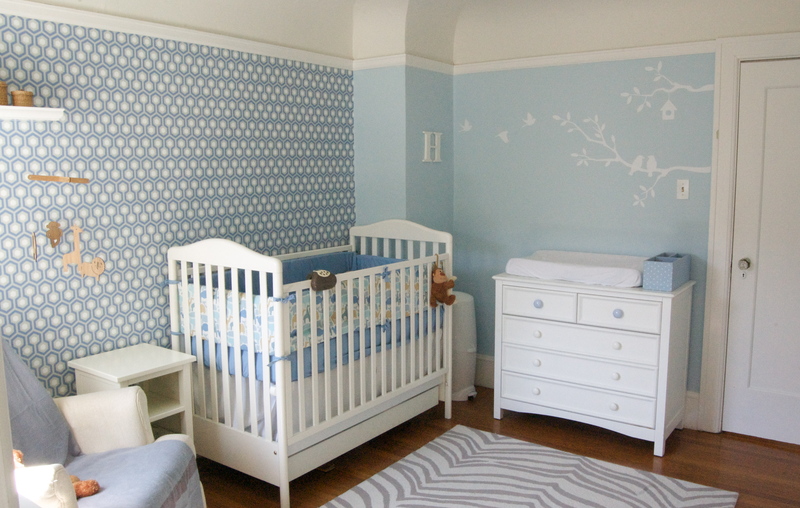 Can you please let me know where the crib bedding is from on the second nautical nursery. Thanks! Can you please tell me where the bedding is from on the second nautical room? Thank! 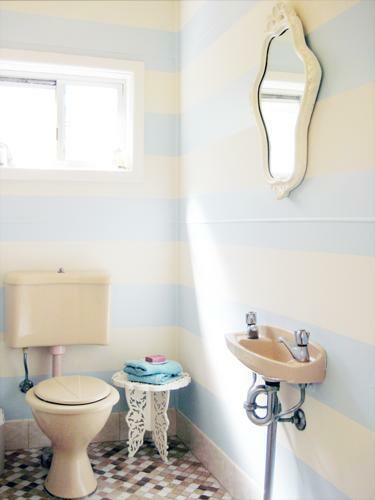 Re stripes photo (one which includes the initial C) : Can you confirm where the blue and white wallpaper is from? Pretty good post. I just stumbled upon your blog and wanted to say that I have really enjoyed reading your blog posts. Thanks for this. Great Designs and good color combination I really love these design. Thanks! !